The letter from Bishop Frank Dewane inserted into the St. Isabel Parish bulletin on March 31, 2019, has brought, yet again, profound anguish and disillusionment to our beloved pastor, Father Christopher Senk, and serves as an instrument of division and distrust within the parish and wider community. Despite what the Bishop says, there is no reason to believe that Pope Francis had any role in this matter or ever saw or approved anything that the Bishop or the Congregation for Clergy proposed. There would have been no reason for the Pope to become involved, since Bishop Dewane was admittedly forced to withdraw his original, unfounded request that Fr. Christopher be dismissed from the clerical state, which is the only action that would have required the Pope’s attention. The Bishop’s artful reference to the “Apostolic See,” as if he were describing actions by the Pope, is misleading, since the Apostolic See actually comprises the entire bureaucracy in the Vatican, such as the Congregation for Clergy. The contention that Fr. Christopher’s acceptance of gifts from members of the parish constituted an “appearance of impropriety” and maybe even “exploitation” cannot be reconciled with the affidavits and other written assurances provided to the Bishop and to the Congregation. Those affidavits were authored by the persons who chose to make those gifts, or who were personally familiar with the circumstances under which they were given. These witnesses from the parish explained that not only did Fr. Christopher not solicit these gifts or trick them into giving them, but in all cases the parishioners chose to show their generosity for his faithful service to the parish without his prior knowledge. Evidence that showed that Fr. Christopher was innocent was disregarded as allegedly “implausible.” This cavalier and condescending dismissal of the evidence from mature and sophisticated members of the parish who know the facts is gratuitously insulting to the witnesses and should be insulting to all members of the parish. Neither the Bishop nor his brother bishops on the Congregation for Clergy in Rome know Fr. Christopher nearly as well – or at all in the case of the Congregation – as do the many parishioners who provided the exculpatory evidence that they chose to ignore. For the Bishop and the Congregation to order Fr. Christopher to move to a remote facility for a year of “prayer and penance,” when he has done nothing warranting any punishment, is unwarranted and cruel. It disregards the fact that he already has been excluded from his home at the rectory, banished from the parish, and forbidden to celebrate the Sacraments publicly for two and a half years. Ironically, Fr. Christopher’s banishment also punishes the parish, the very people the Bishop and the Congregation supposedly are protecting. It is time for the hierarchy to recognize that “enough is enough” – indeed, too much – and to abandon this vendetta against Fr. Christopher. Let us provide more background explaining why we continue to support Fr. Christopher, despite the actions of the Bishop and the Congregation. Not one parishioner has ever stepped forward during Fr. Christopher’s 42+ years of ministry to accuse him of exploitation. The only unhappiness was expressed by a single absentee relative of a parishioner. This relative also made certain that the supposedly exploited person was unavailable for comment by the time that the Bishop initiated his investigation. By that time, of course, the civil authorities in Lee County, to whom this same relative had complained, had concluded that there was no basis to charge Fr. Christopher with any misconduct. Indeed, the Sheriff later provided a letter formally acknowledging that Fr. Christopher had been exonerated by the civil authorities. Even so, after the Bishop decided to open his own investigation, several parishioners, including trained medical and psychological professionals who knew that supposedly exploited parishioner well, provided affidavits that when she chose to make her gifts, she was competent, deliberate, and insistent about her desire to express her appreciation for Fr. Christopher’s assistance to her and the parish in tangible ways. It is difficult to imagine a legitimate reason why the Bishop or the Congregation for Clergy, in full possession of the facts, would decide to impose sanctions based on supposed appearances that that are belied by the evidence. In seeking to understand this action, we note that, at the beginning of Bishop Dewane’s intervention into Fr. Christopher’s ministry, his efforts were geared to having Fr. Christopher dismissed from the clerical state. It is reasonable to infer that this extraordinary action reflected the Bishop’s desire to rid himself of another priest of the diocese who had had the temerity to question the his administration of the diocese. Apparently, it became clear that this tactic would be unsuccessful, so the Bishop had to withdraw this demand that Fr. Christopher be subjected to the death penalty for his priesthood. Fr. Christopher was never advised that this direct threat to his priesthood had been withdrawn almost a year ago, another cruel abuse of a good priest. To allow the Bishop to “save face” in this widely publicized matter, the Congregation allowed him to impose a long sentence of confinement and exile at a site of the Bishop’s choosing. Even if Fr. Christopher completed this year of proposed exile, the Bishop makes no commitment that he will ever allow Fr. Christopher to return to active ministry. The Bishop also foresees a probation period of five years in which he will exercise detailed oversight and scrutiny of Fr. Christopher’s finances. He also assumes the right to exercise this oversight over the future financial dealings of anyone for whom Fr. Christopher “has exercised priestly ministry” over his forty years of ministry. The stated oversight demonstrates a condescending, even contemptuous attitude, toward the laity and particularly the members of St. Isabel’s Parish. The members of this parish are mostly successful professionals, entrepreneurs, people who are highly respected in their respective fields and communities. They have achieved the opportunity to live on Sanibel because of a lifetime of good judgement, personal efforts, and abilities. It is ironic that, in light of the extensive criticism the Bishop has received for his total lack of accountability in managing diocesan resources, he claims the right to oversee individuals in managing their own resources. Further, these people are mostly the ones whom he aggressively targets for funding for his own massive pot of cash. From its inception, Parishioners for Justice has maintained that all abuses of power are inconsistent with the message of the Gospel. The hierarchy has fumbled its responsibility to address predatory sexual abuse, which festered and flourished because of lack of accountability of the bishops. Bishops must be called to account for their failures to respond to all forms of abuse. The actions and activities of the Bishop of Venice are abusive and require assertive reactions that call for an end to this behavior. PFJ takes no pleasure or delight in calling the Bishop to task. We nevertheless have a moral and spiritual obligation to our faith and our community to continue our efforts to right the wrongs of this Bishop that have brought scandal to our Church. We cannot stand by while a good priest is vilified and attacked. We continue to stand with Fr. Christopher and urge all members of the Parish to do so as well. Next postLet them know your OPINION! Are you going to forward the Bishops letter to the Pope? I think it would be a great idea. 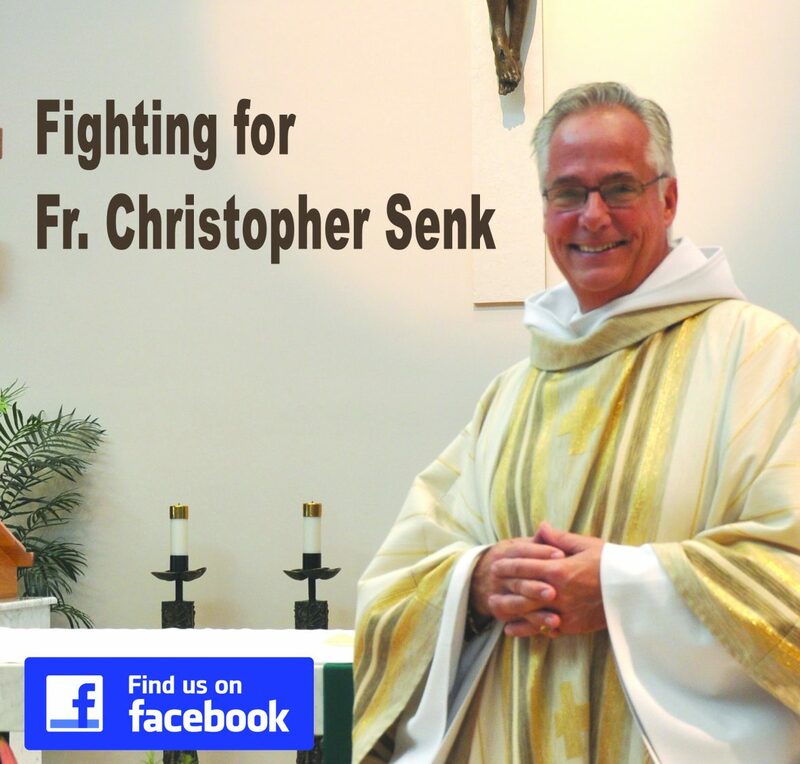 I stand with Fr Christopher Senk in prayer and friendship forever! I have never, in 70 years, known such an inspirational example of a Shepard in the Catholic Church. I am embarrassed and ashamed that our hierarchy is abusing the best example of a priest I’ve ever witnessed.